What is an Edmonton Attractions Pass? What is the difference between an Ultimate Pass and a U-Pick Pass? Where do I buy an Edmonton Attractions Pass? What do I do if my Pass is lost, stolen or I forgot to bring it with me? My ticket doesn’t print properly – what shall I do? What about discounts for seniors, students and groups? What are the Terms and Condition of the Pass? Are they different for each attraction? If I only use the Pass at a couple of attractions, can I get a partial refund? If I purchase a two (2) adult pass must they be redeemed together? Can I cancel an Attraction Pass after my purchase has been completed? Why is Old Strathcona included on the Edmonton Attractions Pass when it is Free anyway? The Edmonton Attractions Pass is a one-stop, value driven Pass that can be purchased online at www.edmontonattractions.com. It allows people to enjoy many of Edmonton’s best Attractions for one low price. The Ultimate Pass is valid for the calendar year in which it is purchased. It allows the user to one admission to every one of the 14 participating Edmonton Attractions for the one low price of $69.95 (+GST) for adults and $49.95 (+GST) for children 3-17. The U-Pick Pass entitles the user admission to their choice of any four Edmonton attractions. Attractions are selected at the time of purchase. This Pass sells for $34.95 (+GST) for adults and $24.50 for children 3-17. Both Passes can be redeemed only once at any of the participating Attractions during their regular operating hours as stipulated on their respective web pages. The Edmonton Attractions Pass is only available as an online purchase at www.edmontonattractions.com. Can I substitute or subtract an Attraction from the U-Pick Pass after I purchase it? Once the four Edmonton Attractions have been selected and paid for by the user in the form of a U-Pick Pass, there can be no substitutions or changes to the Attractions chosen. Prospective buyers are urged to check out all of the Attractions on the Edmonton Attractions website before choosing their four selections. The random voucher code on your Pass is necessary to redeem your admission to each of the Edmonton Attractions that you visit. Many of these Attractions require a copy left behind once you redeem your entry. We urge users to retain their email confirmation in order to print out additional voucher copies as required. In the event you cannot retrieve your email you can contact us at 1-866-714-5903. Reissued Vouchers can only be sent to the original purchasers email address. Click on Print Preview then adjust the size so that 5 coupons are on 1 page and print. The Edmonton Attractions Ultimate Pass already offers a savings of almost 60% off the regular price of the 14 Attractions, so no further discounts are available. Children aged 3-17 do receive a price that is 75% of the cost of an adult Pass. Some of the Attractions have summer seasons and some may have blackout dates. 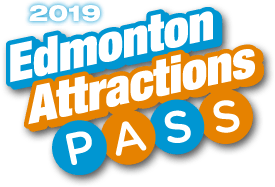 Pass users are urged to go to the respective websites of the Edmonton Attractions prior to purchase to ascertain whether there are conditions of entry or usage during certain dates. The Pass entitles user to one general admission per person. Purchase of additional ticketing may be required for special displays or events. Children 2 years and younger are free when accompanied by an adult. The Pass does not have any cash value, cannot be combined with any other offer, and offer is valid only during regular season and times. Pass must be redeemed prior to expiry date to be valid and is non-transferable. Photo ID may be required (adults only). Can be used only once with each Attraction. As each Attraction’s system differs, you may be required to leave a redemption voucher with the Attraction. Please retain your email to print out additional voucher copies as required. Other conditions may apply for individual Attractions; please see their individual websites for further clarification. There are no refunds available for partial or non-usage of the Edmonton Attractions Pass. Some of the outdoor attractions do have refund policies related to unexpected bad weather however, and Pass users are urged to refer to the weather refund policies of these respective outdoor attractions. Yes, because each voucher has a code a couple or family pass must be redeemed together. If you feel you may visit the Attractions independently, you must purchase two (2) or more passes independently. There is no additional charge. No, unfortunately due to the redemption process, all sales are final. Why is the Old Strathcona included on the Edmonton Attractions Pass when it is Free anyway? The Old Strathcona District participates in the Edmonton Attractions Pass program to highlight that it is an area of interest to visitors and locals alike. Eclectic and historical, it is well worth the time to take a stroll through.